The FTC alleged that weeks after green coffee was first promoted on The Dr. Oz Show, the defendants behind Pure Green Coffee – Nicholas Congleton, Paul Pascual, Bryan Walsh, and the companies they control – began selling their Pure Green Coffee extract, charging about $50 for a one-month supply. 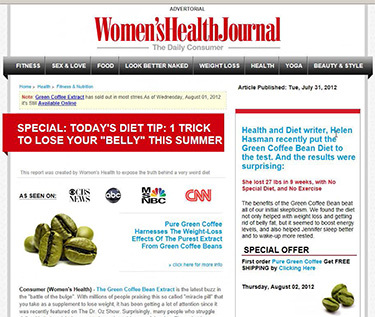 They marketed the dietary supplement through ads on their own sales websites – with names such as buypuregreencoffee.com, buygreenweightloss.com, greencoffeeweightcontrol.com. The sites featured footage from The Dr. Oz Show, supposed consumer endorsements, and purported clinical proof that dieters could lose weight rapidly without changing their diet or exercise regimens. The defendants also ran paid banner and text ads that appeared on search engines and contained phony weight loss claims. Homepage of a fake news site set up to advertise Pure Green Coffee product. The defendants made similar claims on websites they set up to look like legitimate news sites or blogs, but were in fact advertisements, and on other “fake news” sites run by affiliate marketers whom they paid to advertise the Pure Green Coffee product, according to the complaint. The fake news sites featured mastheads of fictitious news organizations such as Women’s Health Journal and Healthy Living Reviewed, as well as logos they appropriated from actual news organizations, like CNN and MSNBC. 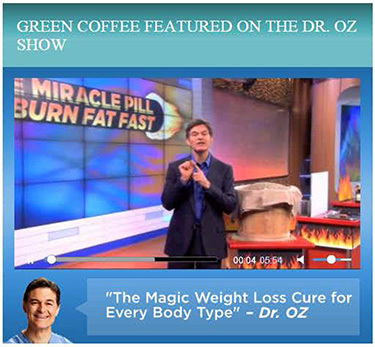 A fake news site offered a playable clip from Dr. Oz's TV show featuring green coffee. that consumers using Pure Green Coffee can lose 20 pounds in four weeks; 16 percent of body fat in twelve weeks; and 30 pounds and four-to-six inches of belly fat in three to five months. that studies prove Pure Green Coffee use can result in average weight loss of 17 pounds in 12 weeks or 22 weeks, weight loss of 10.5 percent, and body fat loss of 16 percent without diet or exercise. that certain websites linked to the defendants’ sites are objective news sites with articles written by objective news reporters and that the comments following the supposed articles reflected views of independent consumers. The FTC also charged the defendants with deceptively failing to disclose that consumers who endorsed the supplement had received it for free and were paid to provide a video testimonial. The complaint also names as defendants the companies used by Congleton, Pascual, and Walsh to market this operation: NPB Advertising, Inc., also doing business as Pure Green Coffee; Nationwide Ventures, LLC; Olympus Advertising, Inc.; JMD Advertising, Inc.; and Signature Group, LLC. The Commission vote authorizing the staff to file the complaint was 4-0-1, with Commissioner McSweeny not participating. The complaint was filed in the U.S. District Court for the Middle District of Florida, Tampa Division on May 15, 2014. NPB Advertising, Inc., et al.